A view of the test section of NACA's Tunnel #1 shown with a model in place for testing. 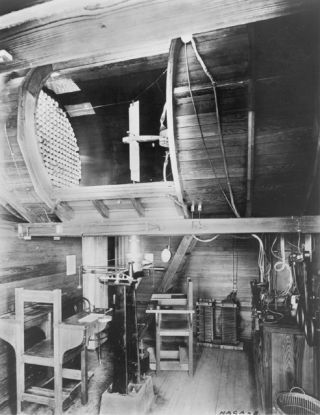 In this historical photo from the U.S. space agency, the test section and balance for the Atmospheric Wind Tunnel (AWT) #1 is shown on May 22, 1921. The 5 foot diameter circular test section and control room of NACA Tunnel No. 1. A Curtiss "Jenny" model can be seen mounted in the test section. Both a real JN4H and a highly accurate model were put through identical tests. The NACA engineers used this data to make the necessary corrections to the wind tunnel.